Email test redirecting to web page? I've never had the email work for me since installation, despite having what I believe to be the correct settings in the correct places. The "Send Test Email" button in Outbound Email Configuration has always just hung, the little spinny thing just sitting and spinning infinitely, no error, no nothing. My cron jobs are all set up and all work perfectly... except for the Testing Outbound Email Connection Job which has never worked - it always gets stuck. I was hoping it would fix itself with the upgrade to v3 (and now v3.0.2) but no luck. It didn't fix itself, but something... odd happened. When I run the same email test I've always been doing (that's always hanged) it doesn't hang anymore. Yay! Weirdly though, it displays my domain's home page instead of a test result. At that point the "Test Message Results" window expands and fills with the DOMAINNAME home page. Interesting as this is, does anyone have any clues as to how to get my email working and/or why it's behaving now as it is? I like Zurmo, but the current inability to tie it in to our business properly with email notifications is holding it back and I'd really really like to get it fixed. Failing that, what's the official Zurmo-recommended way to back everything up and reinstall from scratch? Okay, so I've still managed no solution to this. I have, on a number of occasions and using a number of methods, uninstalled and reinstalled Zurmo completely. When installed fresh (with no data) everything I've described above doesn't happen, and emails appear to work perfectly and as designed. Yay. As soon as I restore to the database the data we've accumulated over the last six months or more - ie everything we've ever done with Zurmo - the emails fail to send and exhibit the odd behaviour detailed in the previous post. So I guess now my question is more along the lines of: what could possibly be in the database that would affect Zurmo's printing as described? What should I look for? Obviously ditching our data and starting again is no solution (and no guarantee the problem wouldn't reappear) but we can't really reach Zurmo's full potential until I can integrate it into our work culture properly through the use of emails (sent via Workflows). Are you able to provide details of your mail configuration? We had quite a few issues setting this up initially that were resolved by changing one of the config files. As soon as the test email send worked, all emails worked properly for us. 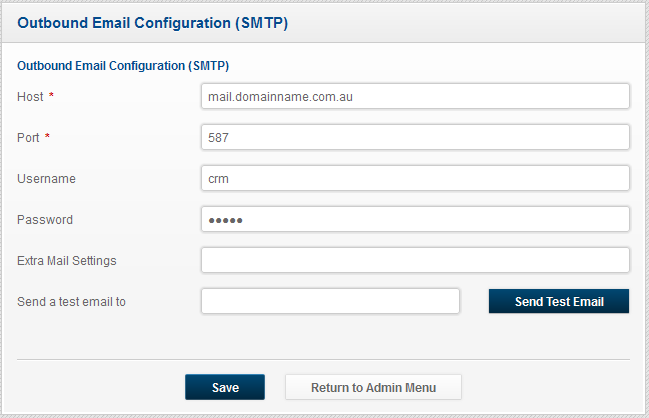 I'm not sure exactly how much you're referring to when you say "mail configuration", but below is a screengrab (values obscured) of the Outbound Email Configuration (SMTP) window of my Zurmo installation (which is the only email I've attempted to configure at this point). I stick a value in the Sent Test Email To field (it doesn't even need to be an email address) and hit Send Test Email. As mentioned, these settings work perfectly until I add the data in the database back in... and then they don't. I've tested this username and values separately to Zurmo and they work just fine. Is this the sort of information you were looking for? Tough situation... would it be possible to selectively import only the non-configuration tables with your customer data? I'm not sure which are the non-configuration ones and which aren't. To be honest, I'm not entirely sure whether I can even restore tables selectively (I've had trouble with the import/export of tables with Zurmo that I haven't had elsewhere, oddly). I see what you're getting at, though. I'm pretty much having the same issue with may email configuration when restore DB from a different server. Did you find out the solution yet?? No, nothing yet. I've tried various different ways of backing up and restoring the information, but every time it gets restored the email stops working. In theory I could start all over again from scratch and not use any of the information I have so far but what's to say it won't happen again? And if I do that then I might as well move away from Zurmo and try something else. Yeah don't count on their help, we're on our own here unfortunately. - STEP ONE: I'd try to search with wildcards in your old database where you have configured your emailaddress/email info (look for email address, SMTP address, etc...). Then you get the tables and locations where this info is stored. Also note the related tables (for instance if there is a reference to a primary key of another table) and also check that information. Keep this info close for later. - STEP TWO: Then perform the new install instance, then only setup your mail config. Next, check your (new) database the same way you did in step one. Compare the two results and find out the differences. - STEP THREE: Import your old info in your new installation, keeping a backup copy of the info of STEP TWO. Your installation should now stop working as you reported earlier. Now try to input the info from your STEP 2 searchresults in your "STEP 3" database tables step by step, where the values are different, until you (hopefully) find the correct config that works. - each time you change your database, clear your cache afterwards in the Zurmo app and also "reload changes" or whatever it's called. See your Administration page / developer options to get to the correct pages. I'll work through your suggestions and see how I go. I'm not especially optimistic at this point, but I do appreciate everybody's attempts to help, truly. Fingers crossed I find something. Hi. I am the manager of a non profit website and I just recently added the Form Builder to my site. I have been able to create the form and put it on my site but I am having trouble with CMS Mailer getting the information from the form to my email address. Help?